A French drain goes by many different names. It is also called a rubble drain, rock drain, land drain or subsoil drain, to name only a few. You have may heard of a French drain before, but what exactly is it? What is it used for? Could your home benefit from one? A wet basement can lead to a multitude of problems in your home, from mould growth to wood rot to structural problems. Installing a French drain, however, will cure this problem. Keep in mind that there are different types of French drains. If water is getting into your basement, you will want to install a deep French drain. A soggy yard can diminish the value you get from your yard. If you’re putting a retaining wall on a hillside, it is necessary to install a French drain in order to prevent water from accumulating. As we said, a French drain is used to divert groundwater away from your home. The premise behind it is very simple: it is a sloped trench that contains a perforated pipe surrounded with gravel. When groundwater rises, it flows into the gravel and then into the perforated pipe. The pipe will then move the water away from the home, whether into a drainage ditch, a dry well or the street. Keep in mind that slotted pipes are typically better than pipes with small holes because the slots prevent debris from accumulating in the pipe, which could prevent water from flowing properly. Some homeowners will also add filter fabric over the gravel to prevent further clogging from debris. The name doesn’t come from the country but from a man called Henry French, who wrote about the idea in a book on the topic of farm drainage in 1859. Professional French drain installation is key. If you are looking for a professional to get the job done, contact our team of experts at Brothers Plumbing today. 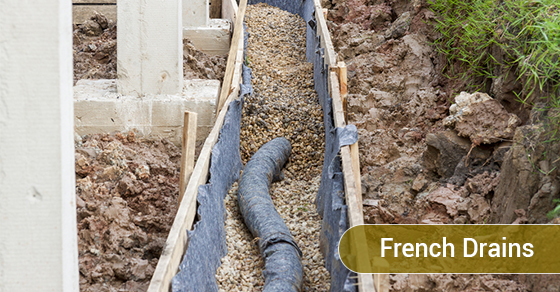 We have over 40 years of experience in French drain construction.